Avoiding a mess at feeding time can be a major challenge, but when clean up means wiping your baby from head to toe and scrubbing the high chair, it can become a real chore. Today, cleaning up mealtime messes just got easier with Messeez, a new high chair cover. Made of lightweight and durable nylon, it can be wiped clean or thrown in the washer and dryer for a more thorough cleansing. 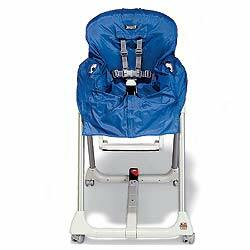 Available in three different sizes, Messeez fits all makes and models of high chairs, as well infant swings. Messeez is easily put on and pulled off and adjusts to seatbelts and other safety devices that are standard in many high chair designs. Lawyer and mom-inventor Joslyn Stuart developed the concept for Messeez when she was pregnant with her second child. "When I pulled my Peg Perego high chair out of storage, I was stunned to see bits of old food stuck in the nooks and crannies," says Stuart. "I searched catalogues, specialty stores, baby emporiums and the internet for some kind of protective cover, and found nothing even close to it in the market." Tiny World - West L.A. Traveling Tykes - West L.A.
Messeez is manufactured by Juvenile Soultions, Inc."